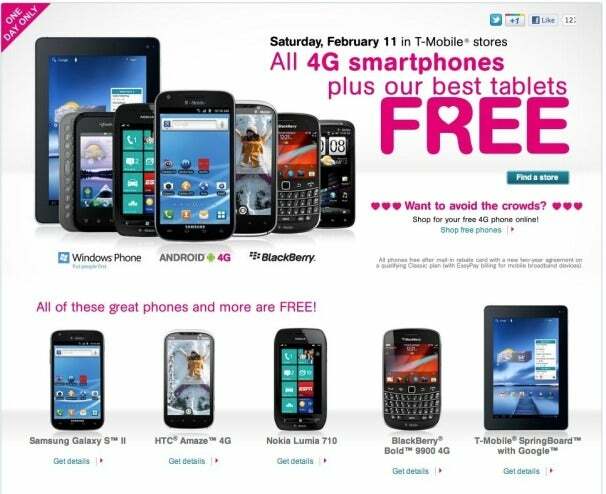 Love is in the air: T-Mobile has announced a one-day Valentine's Day sale to take place on Saturday, February 11. New and existing customers alike will be able to pick up any 4G smartphone, or choose from a selection of tablets and hotspots, for free--after signing up for a new two-year contract, of course. The promotion includes devices such as the popular Samsung Galaxy S II, HTC Amaze 4G, BlackBerry Bold 9900, and many more. To take advantage of the deal, customers will need to sign up for a new two-year contract with a qualifying Classic or Unlimited Value plan (starting at around $59/month). Though the devices are free, you will need to pay up front and send in a mail-in rebate form. One of the better devices you can pick up on this promotion is the T-Mobile SpringBoard, a 7-inch Android tablet that normally costs $400. PCWorld's tablet guru, Melissa J. Perenson, says the SpringBoard is a solid bet for a Honeycomb tablet, and that it has a great display. So if you were thinking of switching cell phone providers--or perhaps picking up an extra phone or tablet--Saturday is the day to do that and save a bundle.